When I was younger, my family had a smallholding with a few animals including chickens, ducks, geese, and few goats – one or two billies and several nannies. Thinking back to these goats made me think about what they can teach us about work in command-and-control organisations. The characteristics of goats, especially curiosity, independence and foraging behaviour, highlight to me how command and control organisations need goat thinkers – constructive rebels including systems thinkers, design thinkers, and humanistic thinkers – to survive. The first thing you notice about actual goats is that they are curious and inquisitive by nature. They will tend to find, do and reach things that you don’t expect. They are not very good at being penned in – they will test their enclosure for gaps or weaknesses. Once found, they will remember and use such gaps. I remember coming home to find that the vegetation in the goat enclosure was not to their liking, and so they would squeeze her head through the fence to get richer material on the outside. 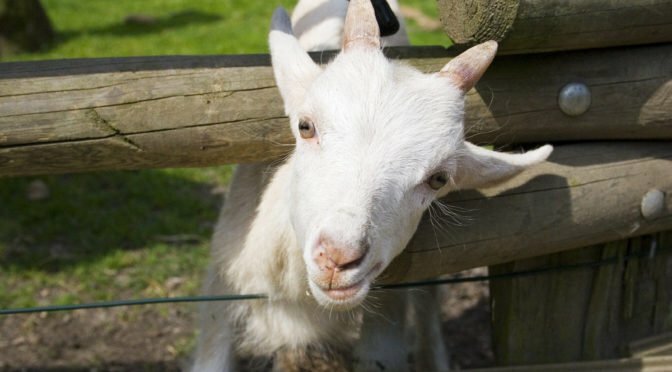 If you enter a goat enclosure, they are quite likely to come to you. Sheep, by contrast, are cautious but indifferent creatures – more wary but less interested. Goats are independent animals, happy to go their own way as well as with other goats. They don’t follow for the sake of following, but rather for the sake of curiosity. Sheep are very much herd animals, conforming with the flock and obedient to the shepherd. In their diet and foraging behaviour, goats are browsers and will taste nearly anything, but they have a varied and nutritious diet – leaves, twigs, vines, and shrubs, as well grass. Goats are flexible and agile creatures and will forage in hard to reach places. Sheep are grazers and tend to prefer short, tender grass, clover and other easy-to-munch stuff. If you want a nice neat lawn, sheep are what you need. But goats will pull out the weeds and aerate the soil while they are at it. In safety-related or other command and control organisations, goat thinkers are not hard to spot. They are usually the ones who expose gaps and unearth opportunities. You will find goat thinkers foraging on a wide variety of material from different fields – more complex, interrelated and challenging. Goat thinkers naturally think outside the pen and so will see beyond artificial boundaries. Goat thinkers need to find out more about what they don’t know – forever a learner – not more about what they already know. They are led by the shepherd of curiosity – constantly finding out more about developing situations, asking difficult questions of themselves and others, admitting and embracing uncertainty, challenging assumptions, decisions, mindsets, and authority. Goat thinkers are the seekers, the questioners, the non-conformers, the innovators and – in some cases – the whistleblowers. Mental conflict: Once you know something, you cannot unknow it. New thinking plus old methods naturally leads to cognitive dissonance. Gradual introduction of new thinking may be necessary – pragmatism and proven small wins set the ground for more radical change. But keep the faith. Frustration: Goat thinkers in a command and control organisation can be frustrated as new perspectives are resisted. Finding the right levers for change is important. Working on the wrong levers, such as died-in-the-wool sheep and die-hard refuseniks, is a waste of time and energy. Patience and constancy of purpose are key. Isolation: Without the mentality and protection of a herd, it may be a lonely and less secure life for the goat thinker. Goat thinkers do not naturally flock, and getting agreement can take time. To overcome isolation, a collective of goat thinkers is crucial. They don’t have to live in the same pen – and might not want to. Ostracism: The frustrated goat thinker, who refuses to share the food, can’t get on with others, and perhaps lowers horns too early, may well be ignored or kept on a leash. (We had a real big billy goat like this!) Prevention is better than cure: be patient, there’s (usually) no need to make enemies; collaborate and involve. Immobilisation: By sticking their neck out of the fence, goat thinkers can get stuck. (Goats really do this. The horns act as a sort of expanding wall plug/screw anchor between fence posts.) Once you have declared the failure of a paradigm, system or process, you are expected to have a solution ready (even though this is neither logical nor fair). Having a next step in hand – needing collaboration – lends credibility. Ethical dilemmas: Goat thinkers may face moral or ethical dilemmas. They need a good compass, and courage. Speaking up is easy if everyone does it, but mostly they don’t. Mostly, it’s down to the goat thinkers. Downsides aside, the abilities of goat thinkers to innovate and weed out critical weaknesses are badly needed. Change doesn’t happen by doing what we always did. It takes someone to try something different. 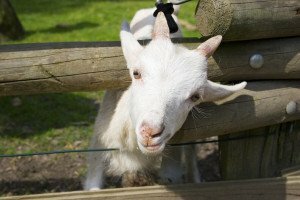 How can we encourage organisations to embrace goat thinking? The question that comes up is where the wolves fit in (thinking about the papers of Shell about sheep and wolves). Are they a kind of aggressive goat? Yes. Unexpected safety insights from the Swedish sheep industry to be uploaded next week! Looking forward to see what will be posted. The world needs more goats! Having grown up around sheep, I’m not too sure about them “being obedient to the shepherd”! Some of our goats would fight any dog which tries to round them up.